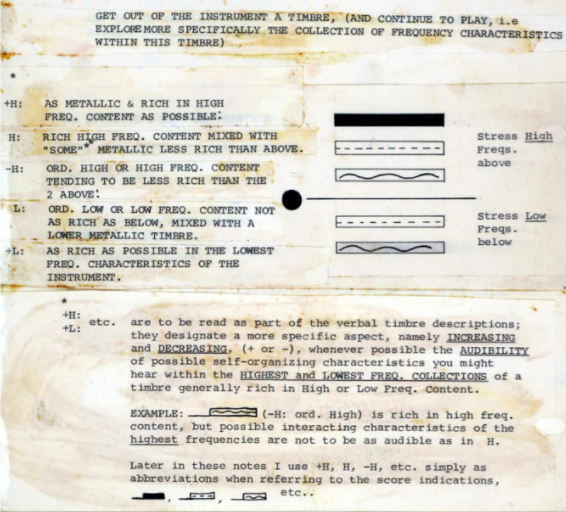 In an early 1960s letter, Maryanne Amacher tells her parents that she will become a composer. She will not take paid work for a year and will, instead, devote herself to putting her musical ideas “on paper,” she tells them. Writing from the University of Illinois at Champaign-Urbana, she is in the middle of working on a duo for percussion and electronics, “Adjacencies.” After joining the Creative Associates at the University of Buffalo in 1966, Amacher will have two performances of “Adjacencies:” a first at Buffalo’s Albright-Knox Gallery and a second, days later, at Carnegie Recital Hall. There, “Adjacencies” appeared after three pieces by Anton Webern and was followed by Charles Wourinen’s “Chamber Concerto for Cello and Ten Players.” The massed sounds of Amacher’s glittering metals, roving around the hall between the four points of “Adjacencies’” quadraphonic speaker array would have certainly stood out, far out. Fig. 1: A page from “Adjacencies.” The integers designate sounds’ locations in one or more of four speakers. Brackets indicate that sound should be fixed at a single location, while arrows instruct players to project that same sound from additional locations. An evocative review of the Carnegie Hall performance speaks of “great tensions built up from accumulations,” offering a suggestive comparison with composer Edgard Varèse. By the late 1920s, Varèse approached writing for percussion ensembles as the assembly of timbrally distinct “sound masses” whose speeds, planes and angles spurred a music drama of interaction, collision, penetration and dispersion. “Adjacencies’” massed sounds certainly draw from this lineage, but it also turns a Euro-American modernism staked on electronics and percussion toward radically different horizons. In the letter to her parents, Amacher suggestively recounts studying with Karlheinz Stockhausen in Philadelphia before moving to Urbana. “[He said] I must work very hard,” she tells her parents, “[he said] how much I was needed.” “Adjacencies” offers a suggestive case in point. 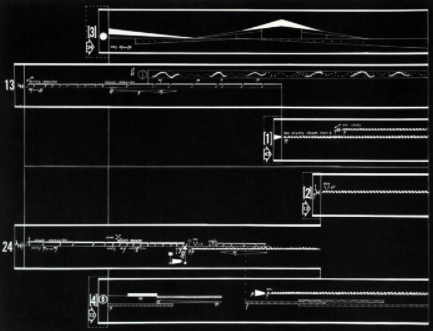 With important modifications to the spatialization techniques of Stockhausen’s Kontakte, Amacher affords her players a flexibility and responsivity to listeners, instruments, and built space that Stockhausen found himself unable, at that time, to achieve. While Mikrophonie I’s adventures with the tam tam take steps in this direction, “Adjacencies’” far vaster battery holds open, for Amacher, wider-ranging concern for her listeners’ bodily awareness over spectral authenticity alone. A closer look at “Adjacencies’” technical details vivifies both points. Rather than move sound – the point-like attacks of much 1960s modernism – around a static perceiver, “Adjacencies” casts sounds, instruments, bodies, ears and built space into a delicate microdrama of shifting proximities. By connecting sounds’ resonant decays with (masked) attacks at new speaker locations, Amacher effects a continuous sounding whose timbre changes as a condition of its movement in quadraphonic space. This, she specifies, is “melody” in “Adjacencies.” Pitches and timbres cohere as “melody,” in this piece, when they are also specified in three-dimensional space. Fig. 3: This is Amacher’s graphical notation for spatializing decay, represented by a dark, trellis-like arc followed the descending dotted line. The strike, on the going, sounds at speaker one, but its bright decay should move to speaker two and then four. 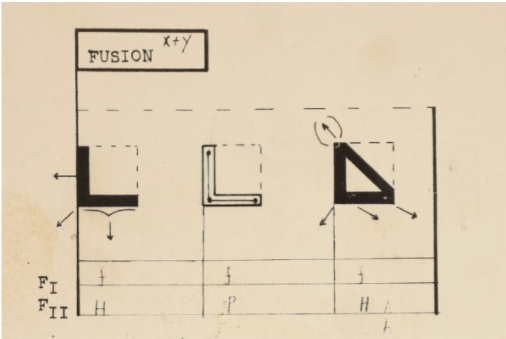 In a 1965 Composition Notebook devoted to the topic of “Space,” Amacher explores using the four vertices of the quadraphonic array to create effects along a square’s sides and diagonals, as though imagining rooms and walls of sound with variable shapes and densities. For an audience seated in the middle of the speakers’ square, the effect might be to be sometimes inside and sometimes outside a shifting sonic architecture. As in the later Music for Sound Joined Rooms and Mini-Sound Series, “Adjacencies” seems to be the making of a special space, a place the audience could enter and linger. Fig. 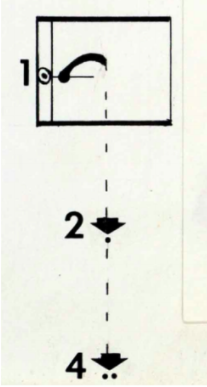 4: Amacher’s Composition Notebook on “Space” engages in detailed consideration of what kinds of sounds can suppress or emphasize the connections between the quadraphonic square’s four speakers. Sometimes she wants to dramatize a diagonal relation and at others emphasize what she calls “side orientation.” In her notes, for example, she often remarks that harp tremolando create especially powerful diagonal effects.